Howdy, new followers. Welcome aboard. What is the secret staying power of a BBC Sci Fi television series that started back in 1963, ran through 1989, was reincarnated in 2005, and still delights its audience today? The magic ingredient of the phenomenal program, Dr. Who, is the unforgettable main character, The Doctor. The Doctor is the last of the Time Lords. His home planet Gallifray was destroyed by his arch-enemies, the Daleks, during the Time War. Ever since, The Doctor travels in his telepathic time machine, a 1960's English phone box called the Tardis, through time and space in an endless loop of adventures. In Dr. Who, The Doctor's wildly imaginative, outside the box escapades have a consistent thread, the Doctor's compassion. He'll go up against the most horrific of foe and still try to find the goodness hidden inside them. While we are screaming for him to zap the enemy with his sonic screwdriver, we love The Doctor for his conscience and quest to always take the high ground. The travels of Dr. Who illustrate over and over that imagination in storytelling is limitless. We can go to anytime, anyplace, real or imagined if we so choose when we tell our stories. The series has encouraged me to crack open my head and free all the fantastical nuggets trapped inside. 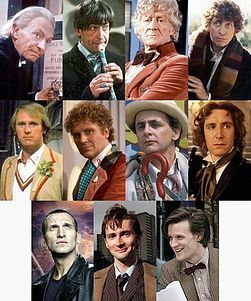 There have been eleven molecularly regenerated Doctors over the span of the program, as well as a succession of derring-do female companions who accompany him on his journeys for a season or two. I say it's time for The Doctor to seek out a new companion...ME! I want to go nebula hopping, watch the sun explode, and ski the rings of Saturn. I even have my own sonic screwdriver. Daleks beware. The Doctor and Leslie are coming your way. Time to share your Dr. Who love. Do you watch? Who is your favorite Doctor, companion, and enemy? If you haven’t seen Dr. Who, what are you waiting for? Click on the Blogging From A to Z Challenge logo in the sidebar to access the links to all the superheroes participating in this blog hop. 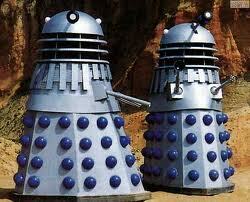 I remember my young neice watching Dr.Who from behind the sofa in the 1970's in Australia. I could never understand why she was frightened of the dialects. hehe. Blog on! I only discovered Dr Who last year. I don't think it was broadcast here until then. It's a great show!! The fact that it's a British import makes it easier for diehards to keep track of the Doctor, since it doesn't air regularly in the States. The only time I've been able to sample it was when it actually did air on regular cable. I love to watch Doctor Who and Torchwood DVDs, which I can get through Netflix. The theme music always makes me grin. And, to answer your question, probably David Tennant. Long Live, The Doctor! David Tennant is my very favorite doctor! 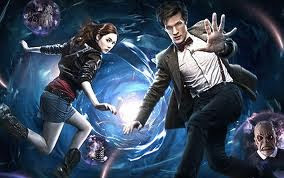 :) I like Amy Pond as the best companion. (Others were quite whiny.) Great post! Me too. Me too. Me too on David Tennant. It took me a long time to watch the new Matt Smith episodes out of loyalty. I have grown very fond of Doctor #11, and Amy is awesome. My favorite companion is Rose. I just adored the love story with her and the Doctor. My husband and I love Dr. Who. We loved Chris E. until David Tennant came along. He is our favorite! We are starting to like Matt Smith, but he does seem a bit young and immature next to David Tennant. We also love Rose. Dr. Who is an amazingly imaginative program. I would love to sit and watch the people on the show work. Thank you, thank you for sharing this! I've been hearing a lot about Dr. Who lately, and have wondered if I should take a look, but I haven't quite done it yet. Now you've convinced me. Off to add it to my Netflix queue! I need something for when I finish all the Castle episodes they have available. Someone just gave me season 1 of Castle. Love Nathan Fillion. Can't wait to dig in. I was a Dr. Who fan back in the Tom Baker days... how things have changed! Like Kathleen, I was a huge fan back in the Tom Baker days. I loved him because he was so cool. We moved away after he was replaced and I haven't seen the show since. I haven't seen many episodes but I did find a few creepy. Nice W word. I never got hooked on the show, but you have to give it props for its longevity. I've only had a chance to catch and episode here and there. The ones I saw captured my interest. But I guess the busy-ness of life did its usual thing and kept me from making Dr. Who a staple show. As much as a SF nerd as I am, as often as I've heard of this series MY WHOLE LIFE, I can't fathom why I haven't seen it yet. It feels like a cosmic force preventing me from seeing Dr Who, probably because if I added one more fun addiction in my life I'd NEVER get any of my own writing done! EVERYONE watches this show. I have to put it on my Netflix. I didn't find out about it until it was already underway, and now I want to see them in order. Love the photo... looks like you "mean business"... LOL! I love Doctor Who. 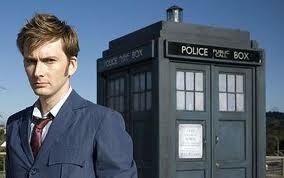 David Tennant is my favorite Doctor and really, the only Doctor for me... just can't get into Matt Smith. He seems so light and silly after the serious Tennant.